I was really excited to reveal the prototypes for the Conspiracy Series last week at the NAMM show in Anaheim, CA. "What's the Conspiracy Series?" you ask? Why, it's the production line of guitars from yours truly! 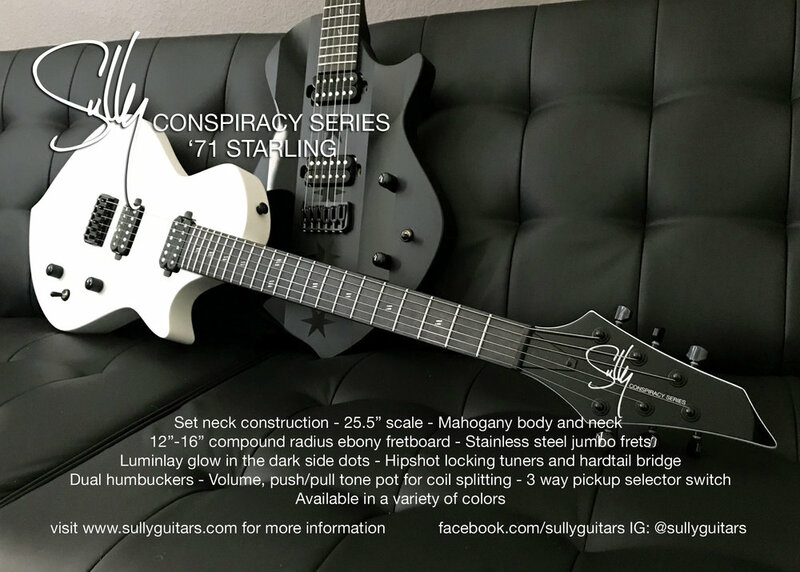 Made in South Korea by World Musical Instruments (same factory that produces Schecter, LTD, PRS SE, and many others), the Conspiracy Series gives me the ability to offer Sullys at less than half of the cost of a custom. The great thing about it is that they share some features with the custom, hand made guitars you're used to seeing from me (stainless steel frets, compound radius fretboards, premium hardware), but there are a few things I can do in the Conspiracy Series that would be cost prohibitive if offered as a custom (the combination of matte and gloss black in the paint job of the '71 SD, for example). The neck shapes are very Sully, the guitars feel solid, and all of the prototypes were acoustically loud and resonant. That's always been the main goal for me; if it rings before you plug it in, that's a good thing. While I was working on the idea of the Conspiracy Series on and off through 2017, I wanted to give the guitars in the series their own identity and style. For example, the Stardust has the 3/3 Aero headstock (which I've always thought was the best headstock for that model) instead of the Raven headstock that you've mostly seen with the Stardust, and it also has a forearm contour (all of the customs have a flat top and binding). Small changes, yes, but things that give them their own style. The '71 Starling is based on the very first '71 I built; it's got a flat top and a forearm bevel that accentuates the shape of the body quite nicely. I also removed the wraparound bridge that is most commonly associated with the '71 and I think that the Hipshot hardtail bridge suits it very well. The first three guitars in the series are the aforementioned Stardust, the '71 Starling, and the '71 SD, which is the Stevie D signature model. Pricing starts at $1099 for the Stardust, the '71 Starling is $1199, and the '71 SD starts at $1249. Additional fan packages that contain extras like signed guitars, VIP Meet and Greets at Buckcherry/Josh Todd and the Conflict shows, and more. Pre-orders are open for a limited time, so check them out here. There are many different payment options available, and there's a bunch of extra information at the Conspiracy Series Facebook Group. The guitars are absolutely killer, and I'm proud to have my name on them. I think you'll dig 'em, too. 2017 has certainly been an exciting year so far, and the summer has been filled with new experiences both personally and as a business. This year is flying by and it definitely feels as if there's not enough hours in the day. That said, here's what's happened this summer! In early June, Grover and I hosted seven campers at his shop in Laguna Hills, California for a "Rock and Roll Fantasy Camp" style guitar building class. We had a lot of fun and built some killer instruments. Collaborations continued through the summer in a way that I never would have expected. 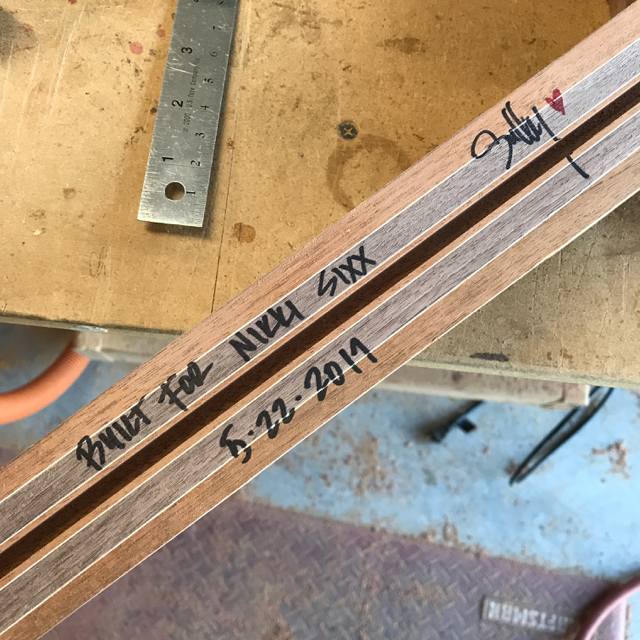 In May, I sent the Raven prototype to Nikki Sixx; he started following the Sully Guitars Instagram feed (you should, too! 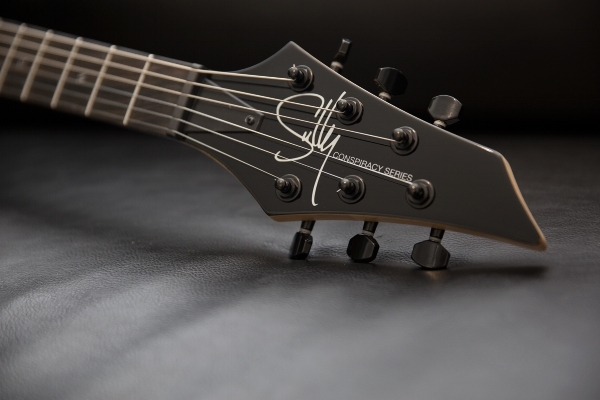 @sullyguitars), and he was interested in checking it out the Raven prototype. I sent it out, he liked it, and we started planning another one. As we discussed options, I learned that he prefers something that looks a little more worn in versus shiny and new. I know that the whole relic thing is one of those hot button topics in the guitar world, but I've always appreciated it as an art form; similar to set decoration in a movie. We decided that Nikki's guitar was going to be set neck (the prototype is a bolt on), mahogany body and neck, an ebony fretboard full of stainless steel frets. :) I had a couple of mahogany/walnut neck blanks already made, so I used one of them for his guitar. Nikki wanted to try out a P90 in the neck and happened to have a set of Seymour Duncan Phat Cats, so we're putting one of them in the neck position. The bridge pickup was given to him as a gift from his friend Stevie D (Buckcherry/Josh Todd and the Conflict), and was made by Arcane Pickups. It's got his signature engraved into the cover, and I think it'll look pretty sweet with the rest of the hardware (chrome Hipshot hardtail bridge and locking tuners). The finish and relic work is being done by Billy Rowe at Rock-N-Roll Relics, and it should be arriving back in Sullyville this week. I'm pretty stoked, to say the least. While working on Nikki's guitar, he told me Stevie D may be interested in the '71. 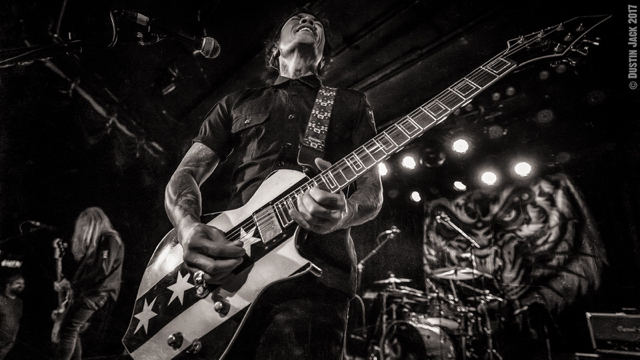 After chatting with Stevie a bit, I sent a demo '71 Trella out, and it's been so great not only to see photos of the guitar getting heavy use on tour with Buckcherry (and now Josh Todd and the Conflict), but also getting to know Stevie as a person. He's a really good dude, and I'm honored to work with him. We quickly put together specs for another '71 Trella that balanced the model's modern stylings with a bit of a ratty feel mixed in. I learned early on that like me, he's originally from Chicago, and we agreed that we had to incorporate the Chicago flag to fit the guitar. This one was also sent to Billy at Rock-N-Roll Relics, and it was such a trip to see a '71 look like a vintage guitar. While the guitar was in the finishing/relic stage, we modified his white '71 to have a similar Chicago flag graphic on it, and you can see it here in the video for Rain by Josh Todd and the Conflict. Stevie and I have some really cool things planned for 2018, and you might get a peek at NAMM! Adam has a '71 Trella in progress and is currently spending time with a Stardust. In the spirit of trying to keep things fresh in the merch department, I've added a couple of new designs. A few months ago, I partnered with Threadless Artist Shops to handle Sully Guitars related tshirts and such, and you can get to the store by clicking here. There may be some swag packs sold off of the Threadless site (they don't really do bundles), so stay tuned for that. 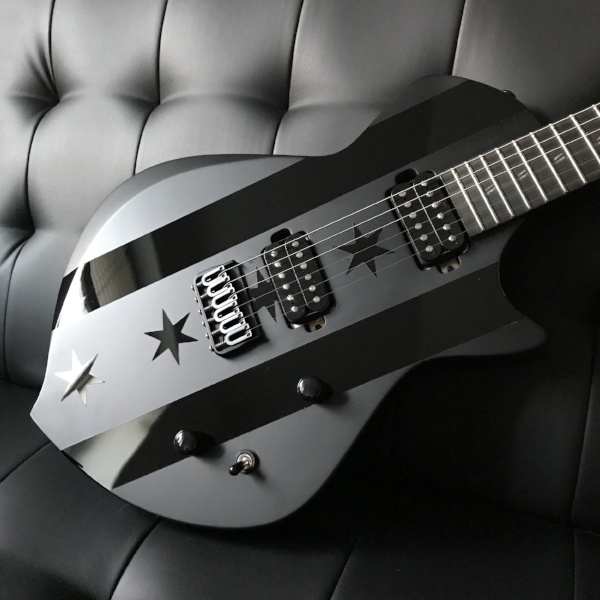 While I'm not ready to spill all of the beans, I will tell you that there will be more 7 string guitars, I've got something really cool planned for the Stardust, and there will be standardized "production" versions of most Sully models. The idea is that they'll be built as I intended each of them to look (with different options for colors). These guitars will still be made locally, but will incorporate CNC machinery. 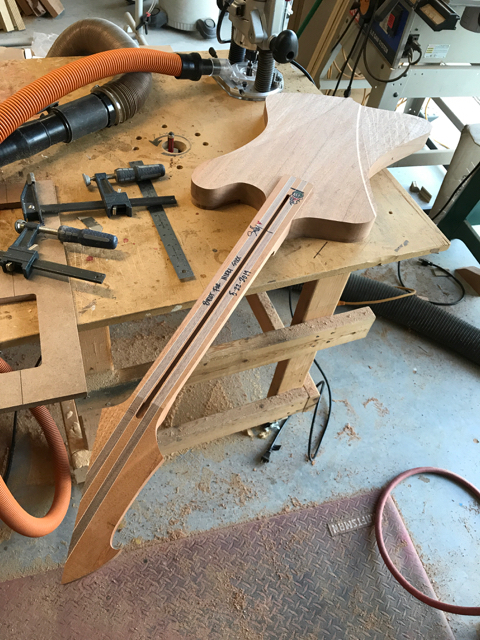 I'm still going to be the one gluing up fretboards, necks (and doing oh so much sanding), as well as the fretwork and wiring and setup and, and, and....you get the point. If all goes as planned, there eventually may be a bit of a drop in pricing for the production series, and this will slowly roll out in 2018. Of course, custom options will always be there for those who want something a little different from the production series guitars, but that pricing is likely to adjust somewhat in 2018. There's a lot more on the horizon, but that's the extent of what I'm comfortable sharing at press time.